After passing through Charlotte, North Carolina several times in the past year (see reviews here), I have grown to love discovering new places to eat in this Southern city. When I began to make plans for my week-long spring break, I knew I would be passing through the city once again on my way to my aunt and uncle's house in Hickory, North Carolina. 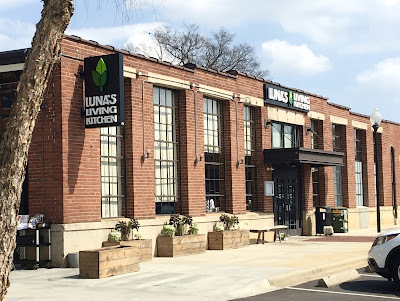 Because I would be flying in late in the morning, my aunt suggested lunch at Luna's Living Kitchen, a 100% vegan restaurant in Charlotte's South End neighborhood. After a stressful pre-break week at school, I couldn't wait to try Luna's plant-based, real food focused menu. What's really cool about Luna's Living Kitchen is that the menu is not only 100% vegan and raw, but also is super gluten-free friendly. All menu items but the bread for sandwiches are gluten-free, but the conscientiousness does not stop there. My waitress assured me that she would alert the kitchen that mine was an allergy order so that they would take extra care to change gloves and use fresh utensils. Bread is segregated to one part of the kitchen to minimize cross contamination. Just a warning- its really difficult to make a definitive choice about what to eat at Luna's. The menu (link here), is expansive and every item listed sounds more delicious than the next. Luckily, the waitress covering my table was gluten-free savvy, as she had celiac and really understood what it means to have safe gluten-free fare. Water is complementary and a jar is placed on every table for easy access. Other drink options include juices, smoothies, elixirs, and other options such as lemonade and home-brewed almond milk. While I was still contemplating the menu, my aunt, uncle and I decided to order the sweet potato sushi. This nori-wrapped roll is stuffed with sweet potato "rice," red bell pepper, arugula and cucumbers. Accompanying it was a sweet Thai chili sauce. I loved the fat slices of the roll and freshness of the veggies, but the roll really came alive when dunked into the amazing sauce. Sweet and spicy, it turned this sauce-avoidant foodie into a believer. Finally deciding upon an entree, I went with the pad Thai, lauded as one of my waitress' favorite picks on the menu. Atop sweet potato and zucchini "zoodles," sat bean sprouts, red bell pepper, and purple cabbage. 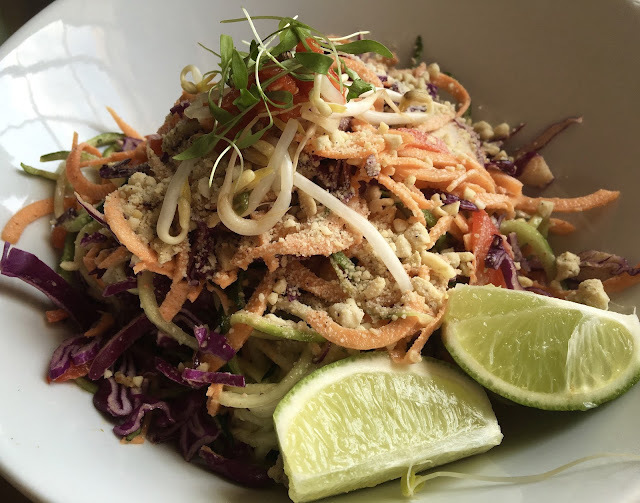 The whole dish was topped with almond butter pad Thai sauce and garnished with sambal and micro greens. As amazing as the dish looked, it was absolutely incredible taste-wise. The sauce had a sweet and sour feel, with a muddiness from the almond butter. The zoodles and veggies were incredibly fresh and flavorful, the whole dish a magical combination of taste and texture. Without being too heated, the dish had spice and flavor. I was simply in love from first bite. My aunt and uncle's orders came out just as beautiful as mine, and because of their gluten and dairy-free nature, I couldn't leave them out. 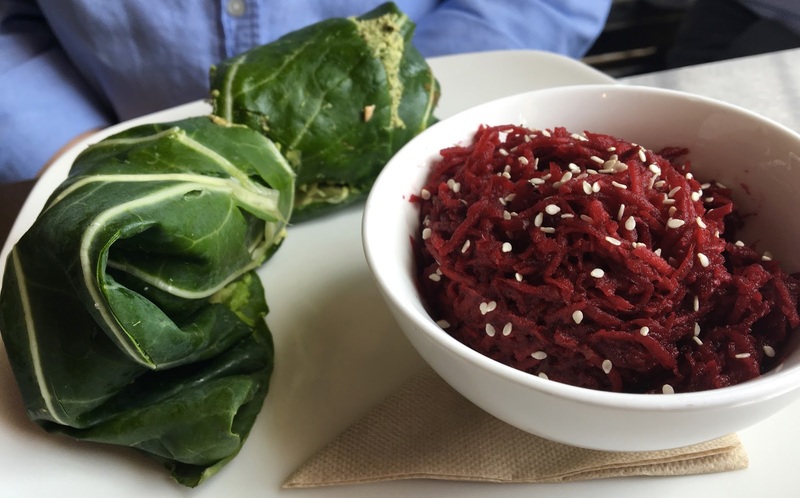 My uncle ordered the rawco taco salad (top) and my aunt ordered the avocado and basil sandwich on a collard wrap with a side of beet salad (bottom). Our waitress laughed that Luna's serves up the most photographed food in Charlotte, which speaks to the loving care and intention placed to not only serving good-for-you food but artistically designed food as well. Leaving Luna's Living Kitchen one cannot help but feel relaxed and refreshed. Good, real food has that effect on you, but the beautiful interior also helps with bright decor and ample sunshine. It's the kind of place you go to and can't help but feel healthier after visiting. 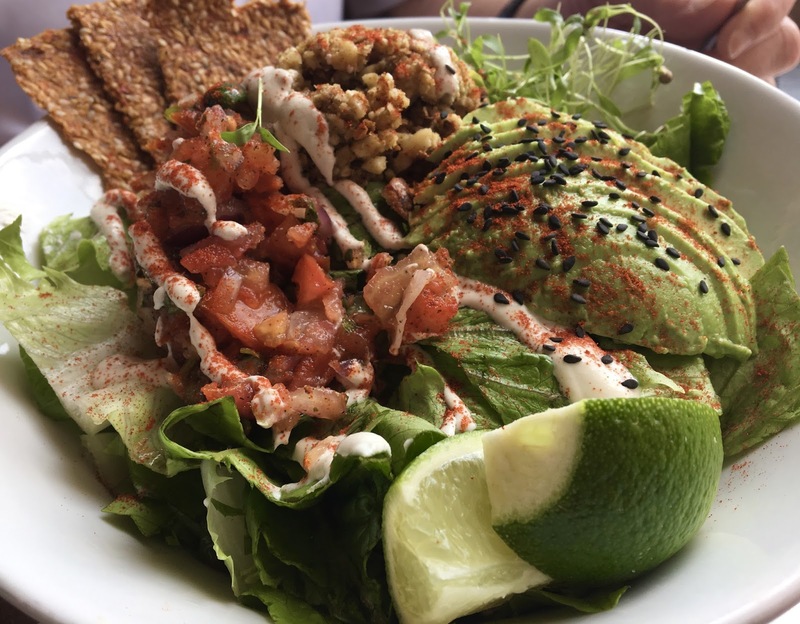 The staff are friendly and helpful, and eating gluten-free is not a song and a dance. If you are ever in the Charlotte area, do yourself a favor and seek out Luna's for a true foodie indulgence. Update 1/17/17: On a return visit to Luna's I ordered the hot chocolate, which can be made with coconut, almond, or hemp milk. I loved the creaminess of the beverage, and the top layer of frothy milk, which definitely gave me the coffeehouse vibe missing from my homemade hot chocolate. I liked that it wasn't too sweet, but would have appreciated a greater depth and intensity of chocolate flavor. For food, I ordered the Vietnamese pho with the oyster mushroom kale side salad. The pho was artfully presented, as the the broth was poured over the vegetables table side. The homemade vegetable broth was rich and smooth, spicy and very warming on a chilly day. 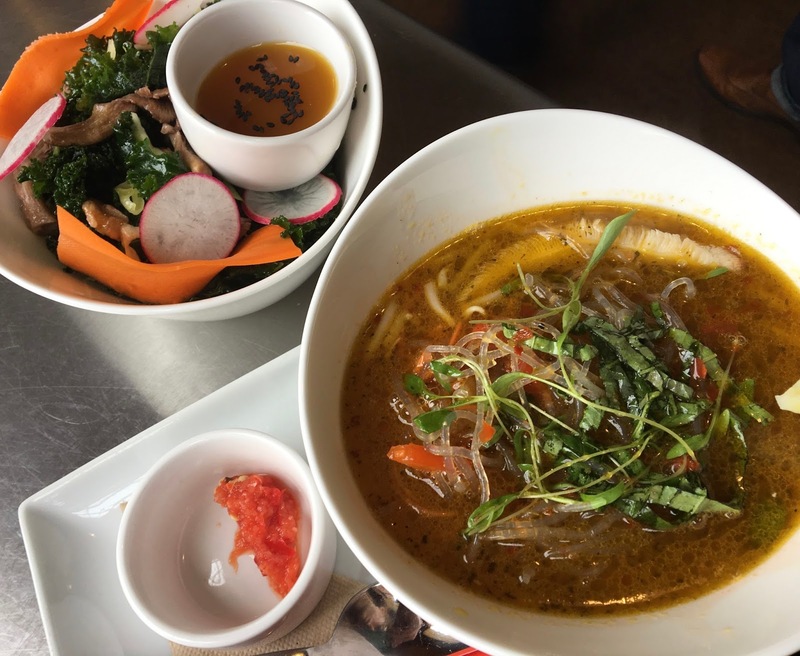 The soup's vegetable contents included bell peppers, shiitake mushrooms, mung beans, celery, carrot, cilantro, kelp noodles, basil and scallions. The standout here was the fresh basil and kelp noodles. The basil was flavorful and fragrant and the noodles were crisp and unique in their eerie translucence. The portion was filling and satisfying. The salad was colorful and a good pair with the soup. The dressing was a real standout, with notes of honey, orange, and ginger to give it dimension and buoyancy. The kale, carrots, and radishes were my favorite, with walnuts scattered to give a textural contrast. I was not a fan of the oyster mushrooms, which I found slimy and oddly textured, but then again I'm not a raw mushroom fan so don't read too much into it. Overall, the return visit reinforced my high regard for Luna's Living Kitchen, and made me even more excited for my next visit.